The Amazon Elasticsearch Service is a fully managed service that provides easier deployment, operation, and scale for the Elasticsearch open-source search and analytics engine. We are excited to announce that Amazon Elasticsearch Service now supports Elasticsearch 5.1 and Kibana 5.1. Painless scripting: Amazon Elasticsearch Service supports Painless, a new secure and performant scripting language for Elasticsearch 5. You can use scripting to change the precedence of search results, delete index fields by query, modify search results to return specific fields, and more. Amazon Elasticsearch Service allows dynamic changes with zero downtime. You can add instances, remove instances, change instance sizes, change storage configuration, and make other changes dynamically. The best way to highlight some of the aforementioned capabilities is with an example. During a presentation at the IT/Dev conference, I demonstrated how to build a serverless employee onboarding system using Express.js, AWS Lambda, Amazon DynamoDB, and Amazon S3. In the demo, the information collected was personnel data stored in DynamoDB about an employee going through a fictional onboarding process. Imagine if the collected employee data could be searched, queried, and analyzed as needed by the company’s HR department. 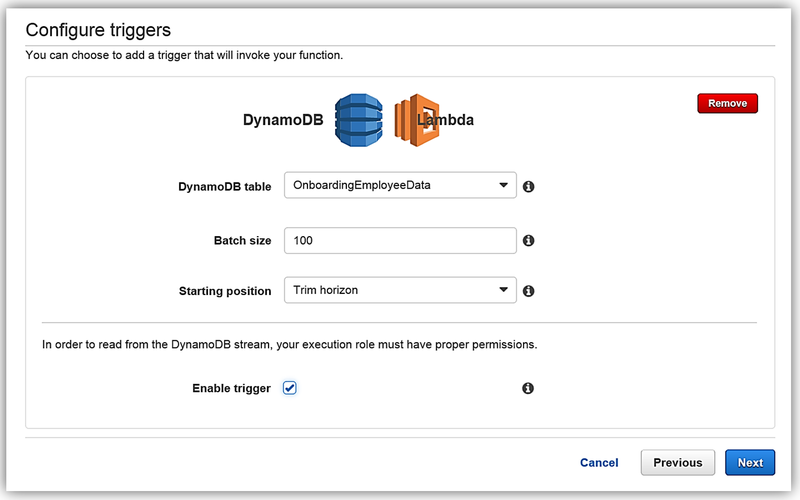 We can easily augment the onboarding system to add these capabilities by enabling the employee table to use DynamoDB Streams to trigger Lambda and store the desired employee attributes in Amazon Elasticsearch Service. We will focus solely on how to dynamically store and index employee data to Amazon Elasticseach Service each time an employee record is entered and subsequently stored in the database. Let’s look at how to implement the employee load process to the Amazon Elasticsearch Service, which is the first process flow shown in the diagram above. Let’s now visit the AWS Console to check out Amazon Elasticsearch Service with Elasticsearch 5 in action. As you probably guessed, from the AWS Console home, we select Elasticsearch Service under the Analytics group. The first step in creating an Elasticsearch solution is to create a domain. You will notice that now when creating an Amazon Elasticsearch Service domain, you now have the option to choose the Elasticsearch 5.1 version. 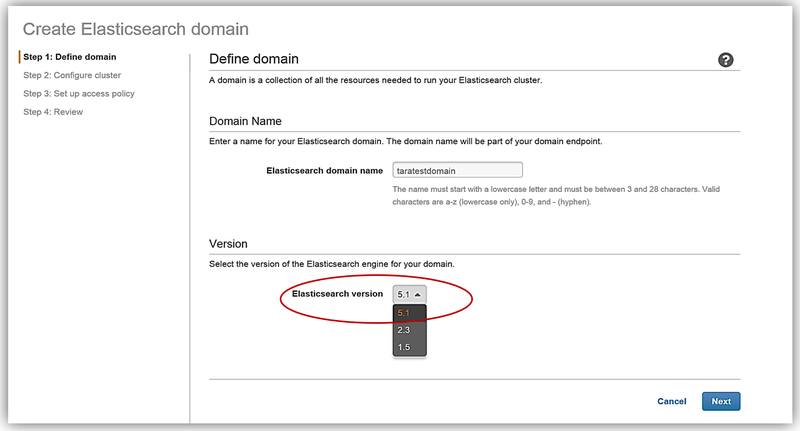 Since we are discussing the launch of the support of Elasticsearch 5, we will, of course, choose the 5.1 Elasticsearch engine version when creating our domain in the Amazon Elasticsearch Service. 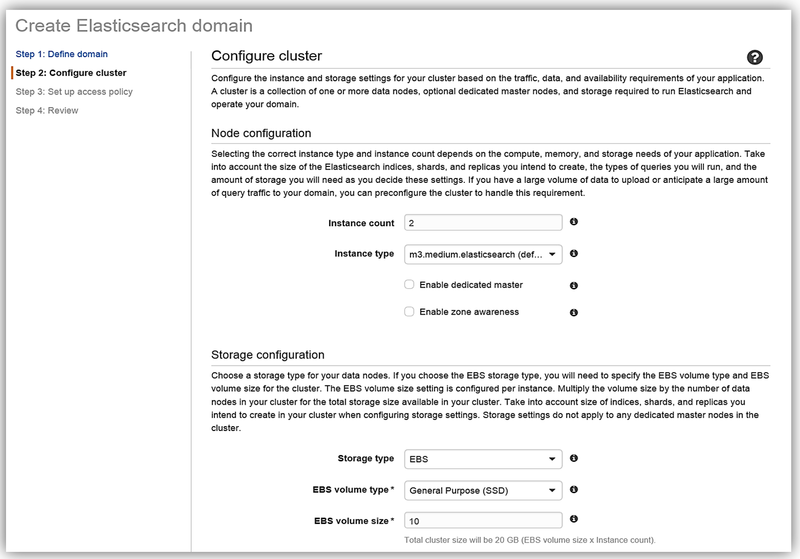 After clicking Next, we will now setup our Elasticsearch domain by configuring our instance and storage settings. The instance type and the number of instances for your cluster should be determined based upon your application’s availability, network volume, and data needs. A recommended best practice is to choose two or more instances in order to avoid possible data inconsistencies or split brain failure conditions with Elasticsearch. Therefore, I will choose two instances/data nodes for my cluster and set up EBS as my storage device. To understand how many instances you will need for your specific application, please review the blog post, Get Started with Amazon Elasticsearch Service: How Many Data Instances Do I Need, on the AWS Database blog. All that is left for me is to set up the access policy and deploy the service. Once I create my service, the domain will be initialized and deployed. Now that I have my Elasticsearch service running, I now need a mechanism to populate it with data. I will implement a dynamic data load process of the employee data to Amazon Elasticsearch Service using DynamoDB Streams. Before I head to the DynamoDB console, I will quickly cover the basics. Amazon DynamoDB is a scalable, distributed NoSQL database service. DynamoDB Streams provide an ordered, time-based sequence of every CRUD operation to the items in a DynamoDB table. Each stream record has information about the primary attribute modification for an individual item in the table. Streams execute asynchronously and can write stream records in practically real time. Additionally, a stream can be enabled when a table is created or can be enabled and modified on an existing table. You can learn more about DynamoDB Streams in the DynamoDB developer guide. 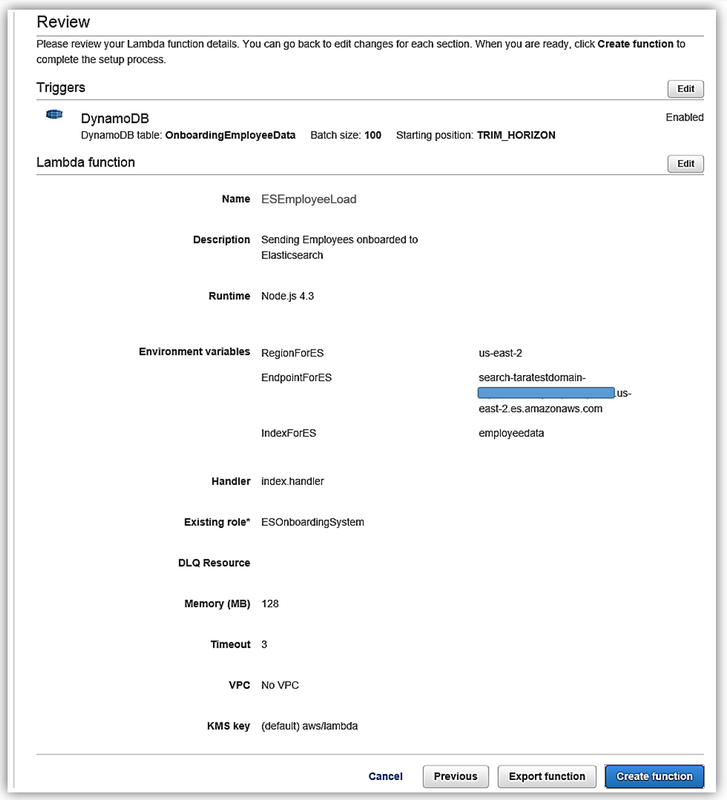 Now we will head to the DynamoDB console and view the OnboardingEmployeeData table. This table has a primary partition key, UserID, that is a string data type and a primary sort key, Username, which is also of a string data type. We will use the UserID as the document ID in Elasticsearch. You will also notice that on this table, streams are enabled and the stream view type is New image. A stream that is set to a New image view type will have stream records that display the entire item record after it has been updated. You also have the option to have the stream present records that provide data items before modification, provide only the items’ key attributes, or provide old and new item information. 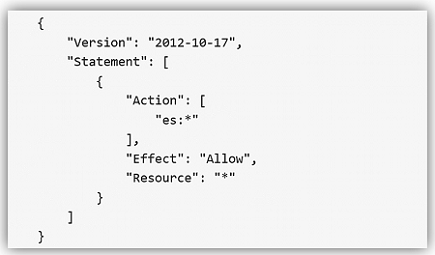 If you opt to use the AWS CLI to create your DynamoDB table, the key information to capture is the Latest Stream ARN shown underneath the Stream Details section. 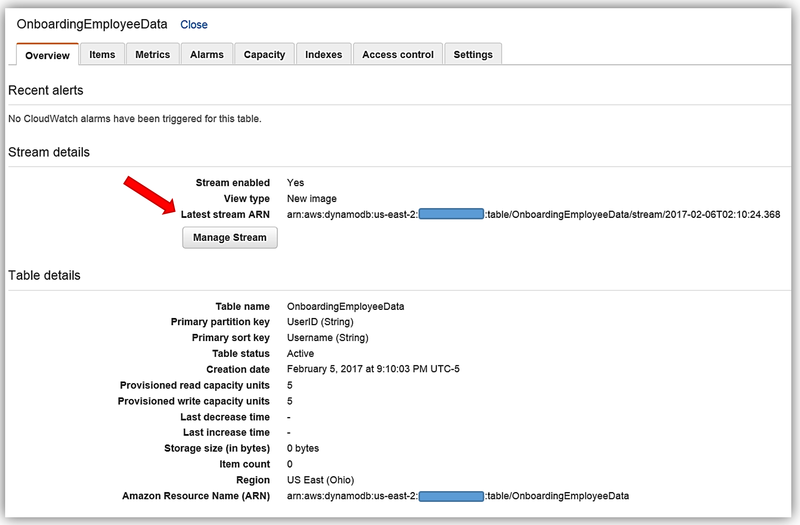 A DynamoDB stream has a unique ARN identifier that is outside of the ARN of the DynamoDB table. The stream ARN will be needed to create the IAM policy for access permissions between the stream and the Lambda function. The first thing that is essential for any service implementation is getting the correct permissions in place. Therefore, I will first go to the IAM console to create a role and a policy for my Lambda function that will provide permissions for DynamoDB and Elasticsearch. First, I will create a policy based upon an existing managed policy for Lambda execution with DynamoDB Streams. This will take us to the Review Policy screen, which will have the selected managed policy details. I’ll name this policy, Onboarding-LambdaDynamoDB-toElasticsearch, and then customize the policy for my solution. The first thing you should notice is that the current policy allows access to all streams, however, the best practice would be to have this policy only access the specific DynamoDB Stream by adding the Latest Stream ARN. 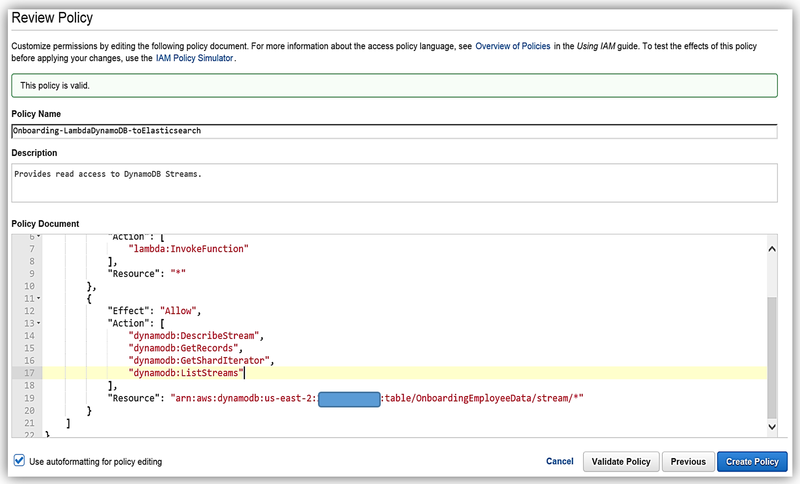 Hence, I will alter the policy and add the ARN for the DynamoDB table, OnboardingEmployeeData, and validate the policy. The altered policy is as shown below. I will use this policy and add the specific Elasticsearch domain ARN as the Resource for the policy. This ensures that I have a policy that enforces the Least Privilege security best practice for policies. 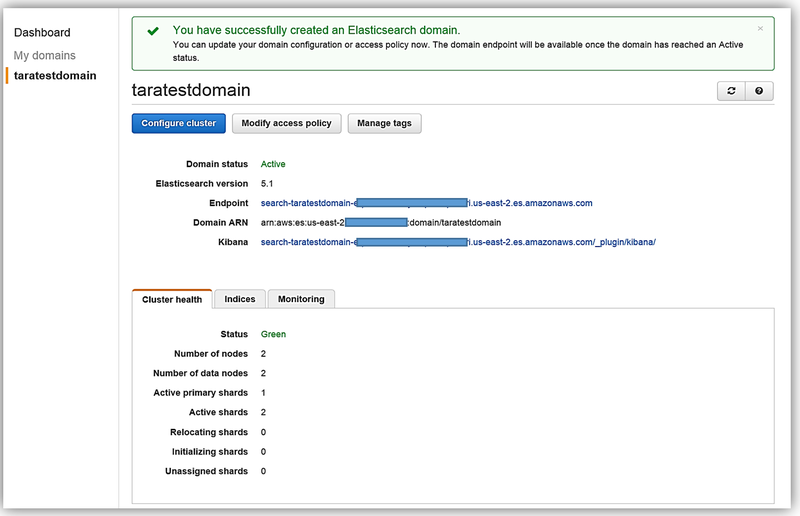 With the Amazon Elasticsearch Service domain added as shown, I can validate and save the policy. The best way to create a custom policy is to use the IAM Policy Simulator or view the examples of the AWS service permissions from the service documentation. You can also find some examples of policies for a subset of AWS Services here. Remember you should only add the ES permissions that are needed using the Least Privilege security best practice, the policy shown above is used only as an example. We will create the role for our Lambda function to use to grant access and attach the aforementioned policy to the role. AWS Lambda is the core of Amazon Web Services serverless computing offering. With Lambda, you can write and run code using supported languages for almost any type of application or backend service. Lambda will trigger your code in response to events from AWS services or from HTTP requests. Lambda will dynamically scale based upon workload and you only pay for your code execution. We will have DynamoDB streams trigger a Lambda function that will create an index and send data to Elasticsearch. Another option for this is to use the Logstash plugin for DynamoDB. However, since several of the Logstash processors are now included in Elasticsearch 5.1 core and with the improved performance optimizations, I will opt to use Lambda to process my DynamoDB stream and load data to Amazon Elasticsearch Service. Now let us head over to the AWS Lambda console and create the lambda function for loading employee data to Amazon Elasticsearch Service. I hit Next button, and I am on the Configure Function screen. The name of my function will be ESEmployeeLoad and I will write this function in Node.4.3. //The AWS credentials are picked up from the environment. I will select an Existing role option and choose the ESOnboardingSystem IAM role I created earlier. 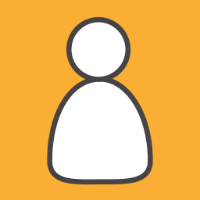 Upon completing my IAM role permissions for the Lambda function, I can review the Lambda function details and complete the creation of ESEmployeeLoad function. I have completed the process of building my Lambda function to talk to Elasticsearch, and now I test my function my simulating data changes to my database. Now my function, ESEmployeeLoad, will execute upon changes to the data in my database from my onboarding system. Additionally, I can review the processing of the Lambda function to Elasticsearch by reviewing the CloudWatch logs. Now I can alter my Lambda function to take advantage of the new features or go directly to Elasticsearch and utilize the new Ingest Mode. An example of this would be to implement a pipeline for my Employee record documents. I can replicate this function for handling the badge updates to the employee record, and/or leverage other preprocessors against the employee data. For instance, if I wanted to do a search of data based upon a data parameter in the Elasticsearch document, I could use the Search API and get records from the dataset. The possibilities are endless, and you can get as creative as your data needs dictate while maintaining great performance. All Amazon Elasticsearch Service domains using Elasticsearch 5.1 are bundled with Kibana 5.1, the latest version of the open-source visualization tool. 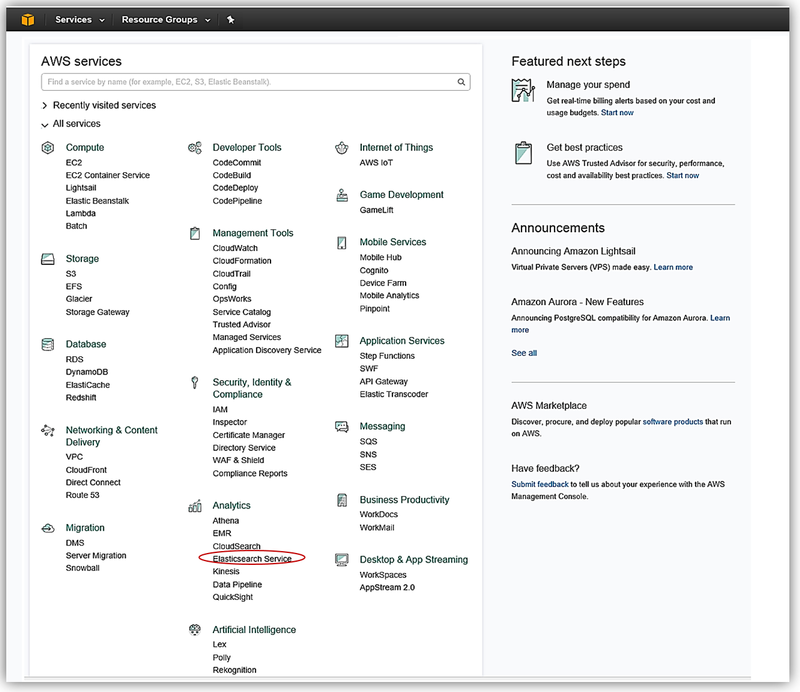 You can read more about the supported operations for Elasticsearch in the Amazon Elasticsearch Developer Guide, and you can get started by visiting the Amazon Elasticsearch Service website and/or sign into the AWS Management Console. [October 4, 2018, 1:42 PM] Park, Robin: Tara was a Technical Evangelist for Amazon Web Services, dedicating her time to help developers build apps, games, and technical solutions in the AWS cloud. Tara worked on evangelizing AWS cloud computing architectures and development for various technologies like Mobile, Gaming, IoT, AI, Serverless just to name a few. Tara’s background is as a software engineer & developer who has worked on wide-ranging development platforms and systems while leveraging a myriad of development languages across her various technical and engineering roles. Over her 20+ year career, she has been employed by Microsoft, Turner Broadcasting/Time Warner, Georgia Pacific, and various other Fortune 500 companies. She holds a Bachelor’s degree from Georgia State University, and currently working on her Master’s degree in Computer Science (MSCS) at Georgia Institute of Technology. Tara's passion is to continue spreading the “good news” to diverse audiences about a plethora of technologies, development languages, and frameworks with a focus and proficiency in: - Cloud computing and Serverless architectures - IoT (Internet of Things) development - Mobile, Game, and Web development - Artificial Intelligence services and frameworks - NUI (Natural User Interfaces) & Biometric Interface service frameworks - Cross-Platform development frameworks You can find Tara on Twitter at @taraw.